Hills has issued a voluntary food recall for some of its canned dog food due to excessive levels of Vitamin D. No dry dog food, dog or cat treats or wet or dry cat food were affected. We have removed the affected cans from our shelves. 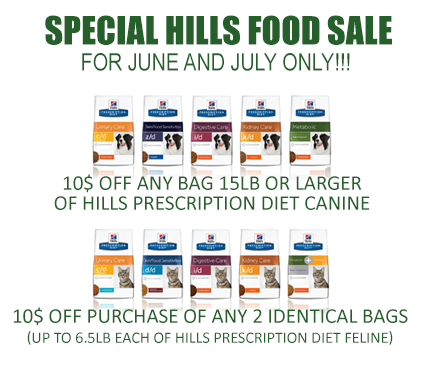 Please let us know if you have purchased Hills canned dog food in the past several months and we can check to see if it might have been affected. The recall is only for certain lot numbers of certain types of canned dog food. You may also read the attached list at the bottom of this page for full details. Please do not hesitate to call us at 808.593.9336 with questions or concerns. We are open 7 days per week from 8am to 5pm and Thursdays we offer extended hours until 8 pm. As always, if you feel your pet is having an after-hours emergency, please call our after-hours emergency line at 808.988.2188 and you will be connected to Dr. Hsu. Below are two websites where you can register for free pet food alerts. We sincerely apologize for any inconvenience.